As promised last week, The CW network today released a new Apple TV app that allows all fourth-generation Apple TV owners to watch new episodes of shows on the network for free with no cable authentication or login required. All of the shows on The CW, including Supergirl, The Flash, Jane The Virgin, Arrow, Crazy Ex-Girlfriend, iZombie, Supernatural, DC's Legends of Tomorrow, The 100 Vampire Diaries, Reign, and The Originals are available to watch, with ads. Users simply need to download the app and click play on a show to watch, with no other hoops to jump through. The CW's iOS and Apple TV apps focus on only the newest episodes, with no archived content available from past seasons. Only five episodes from the most recent season are available to watch, but it's all free and should be welcome news to cord cutters who are hoping other television networks might adopt similar policies. 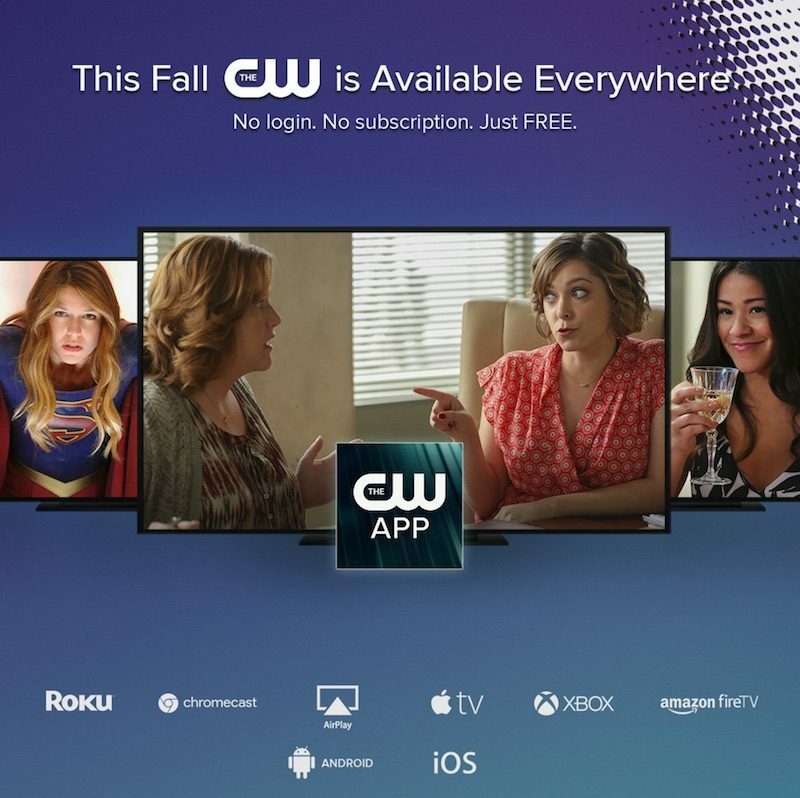 On iOS devices, an update to the CW app introduces support for both AirPlay and Chromecast, allowing content from the iOS app to be streamed to a television set as an alternative to using the Apple TV app or as a way to watch The CW's content on television sets without owning a fourth-generation Apple TV. CW is the T-Mobile of television, and that's a compliment. They are gonna going to piss off the cable and satellite companies doing this, but their younger viewer base is going to reward them well in the end. Hey cable companies, why the heck should we pay again for TV that already has commercials in it? Their banner needs some diversity, it's lacking men. This is great news. Good for CW for doing right by the people who want to watch their shows. This is great for CW. Just wish they would also create a No Commercial Tier for those willing to pay for it. Really hate we lost this option under Hulu. I recommend checking out Crazy Ex-Girlfriend. One of my favorite TV shows. That's my guilty pleasure: The Flash. Can't get enough of that show. My ladyfriend and I binged Crazy Ex-Girlfriend on Netflix. It's a fantastic show that slightly fills the hole left behind by Flight of the Conchords. I'd prefer to make SJWs think a little about their own hypocrisy. This is the type of cry-baby, over-sensitivity people hate about your movement. Now, c'mon AMC and HGTV, and I'm set. What is taking so damn long for everybody else to get with the program (rhetorical...I lnow why)??? LOL, you had to go there.